Hannes Bok was a difficult, obsessive, nearly friendless recluse who may have died of starvation. He is also considered to be one of the most talented science-fiction and fantasy illustrators of the twentieth century, and got his start in the business with the help of a young Ray Bradbury. But when Bok lived in the Zenith City during his high school years in Duluth, he was known as Wayne Woodard. By today’s terms, Bok’s parents married young. His father, Irving Ingalls Woodard, was born in Illinois on December 28, 1888, and, among other things, worked as an electrician and salesman. Bok’s mother was Julia (Parks) Woodard, born in New Hampshire on June 23, 1888. In the 1890s, the Parks family moved from New Hampshire to Illinois, where her father practiced law. Irving and Julia were married in Chicago on November 14, 1906—he was only seventeen years old, she just a year older. Their first son, Irving Jr., was born in Boston on January 25, 1909. They returned to Illinois the following year. By 1914 the family had moved to Kansas City, where Bok was born Wayne Francis Woodard on July 2. By 1917 they were living in St. Paul, Minnesota, and his father was working as a lineman for the St. Paul Gas & Light Co. Around 1920, his parents divorced, and Irving Jr. ended up in the Minnesota State Training School for Boys at Red Wing, reportedly because his father couldn’t support both sons. But he apparently could afford a second wife, and soon Irving Sr. married 25-year-old Carolyn Bannitz, a native Minnesotan. Irving, Carolyn, and Wayne moved to Duluth around 1929, living at 118 South 14th Avenue East. In Duluth, Irving worked as an insurance salesman. Irving and Carolyn’s son, William Grant Woodard, was born in Duluth on February 7, 1930. After his parents divorced, Wayne had continued a correspondence with his mother Julia, who had moved to Seattle, Washington, where she managed a rooming house and worked part-time as a cashier in a small restaurant. According to his biographer, Emil Petaja, Wayne’s father and stepmother disapproved of his interest in art and tried to discourage him from becoming an artist. However, his teacher encouraged art as a career, and his mother supported his dream of becoming an artist. So after high school, feeling too stifled by his father and stepmother, Wayne left Duluth and hitchhiked alone to Seattle to be with Julia. His older brother Irving had already joined her there. In Seattle, Wayne found occasional part-time work and rented a cabin for $3 a month. There he practiced his painting. Petaja says he applied the practical lessons he learned in high school art classes and learned his own techniques. Living on practically nothing, he often visited his mother for meals. It was at this time that Wayne began referring to himself, and signing his paintings, as Hannes Bok, a kind of tribute to one of his favorite composers, Johann Sebastian Bach. He also studied other artists’ work, reading voraciously the collection of art books in the Seattle Public Library. He admired the art of Maxfield Parrish, corresponded with him, and later visited Parrish on his New Hampshire farm. Bok became enamored with the fantasy writings of Abraham Merritt and wrote letters to Merritt expressing his appreciation for his work. Unable to purchase books, he once copied in handwriting a library copy of one of Merritt’s novels. In the fall of 1937, Bok traveled to Los Angeles, moving in with Emil Petaja. One night, Petaja took him to a meeting of the Los Angeles Science Fiction Society where Bok met a young Ray Bradbury, who was trying to begin a career as a writer. Bok also painted while in Los Angeles and visited some Hollywood studios with his portfolio. Nothing came of his efforts, however, and after a year or so Bok returned to Seattle, where he found employment with the Works Progress Administration Federal Art Project. He also continued to correspond with Ray Bradbury, who was very much impressed with Bok’s work. Bradbury, who was going to New York for the first World Science Fiction Convention in early July of 1939, offered to take some of Bok’s work to show New York publishers. Bok sent Bradbury his portfolio, and Bradbury managed to sell a painting to Farnsworth Wright, editor of Weird Tales magazine, who used it for the cover of the December 1939 issue. It was Bok’s first big break. The slum on 109th Street was typically run-down…the stench of garbage cans lined below was omnipresent. There was no air-conditioning, yet Hannes hated to open his windows while he worked at his huge desk because the soot from the incinerators of the hospital across the street would sift in and flake down on his wet paintings and ruin them. Winters were shuddery cold. He walked up five flights. There was no hot water. Bok lived a relatively lonely life there for about twenty-four years. In the early 1940s, his paintings were in great demand for Weird Tales and other fantasy and horror magazines and for dust jackets of science-fiction novels. But he wasn’t getting rich: the typical pay for cover art was $75, and only $5 for an interior drawing. Bok was a perfectionist and often spent days working on one painting. He was also often difficult to work with, sometimes losing jobs because of arguing with editors and refusing to do what they wanted. Because of his eccentricities, many of his friends gradually stopped visiting him. So he lived a lonely life of poverty. Writer Frederik Pohl tells about a visit to Bok’s apartment in the early 1950s. Bok was hounding an editor for payment on a future painting—Pohl says Bok had lost his teeth and wanted the money to get his dentures repaired; at the time he was in his late thirties. Bok also wrote fiction, including The Sorcerer’s Ship and Beyond the Golden Stair. He completed some of Abraham Merritt’s works that Merritt had failed to finish at the time of his death. Bok wrote a conclusion to Merritt’s unfinished story “The Fox Woman,” which was published in 1946 as “The Fox Woman and The Blue Pagoda.” He also wrote the last twenty chapters of Merritt’s unfinished novel The Black Wheel, published in 1947. 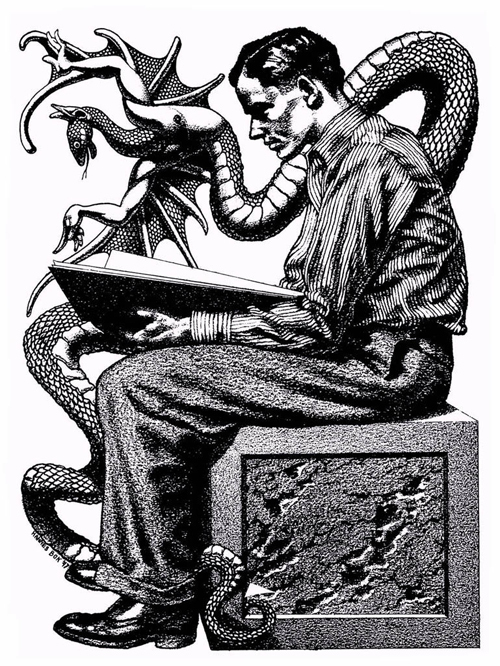 Bok wrote nearly 100 poems, many of which were published in fantasy and horror magazines. In 1953 he won science fiction’s Hugo Award for Best Cover Artist. Hannes Bok lived his last years in the tenement apartment in relative isolation and extreme poverty. He died in his sleep on April 11, 1964, of a heart attack. Some felt the real cause of his death was starvation due to his poor diet. His mother Julia died in Belleview, Washington, on April 19, 1965. His father Irving and stepmother Carolyn died in Beaumont, Texas. After Bok’s death, his friend Emil Petaja published a biography, And Flights of Angels: The Life and Legend of Hannes Bok (1968), and helped start the Bokanalia Foundation, which has published some of Bok’s poetry and portfolios of his art.